Wow! I can't believe that it is 2015! 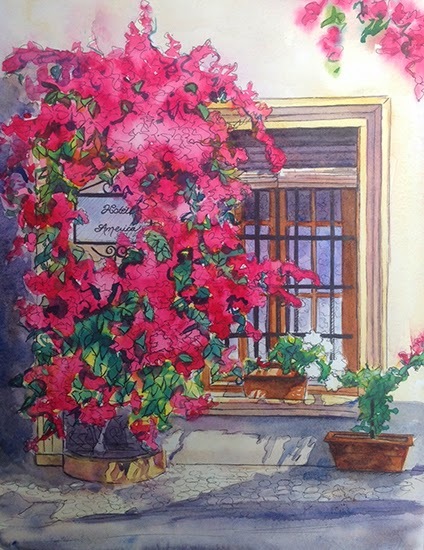 And I am just tickled that my painting, Tickled Pink sold to a lovely and wonderful patron. What a great way to end 2014 and to start a new year. Ok. There it is. I've said it. Now I have to do it, right? 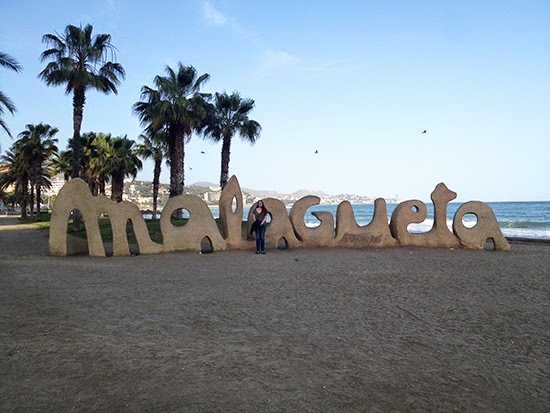 I would love a little nudge every now and then from my readers to remind me to get me moving. I would also love to hear what your artistic goals for the year will be. Perhaps we can help each other along as we resolve to create more in the coming year. I've finally been able to get back to egg tempera now that classes are winding down for the holiday season. 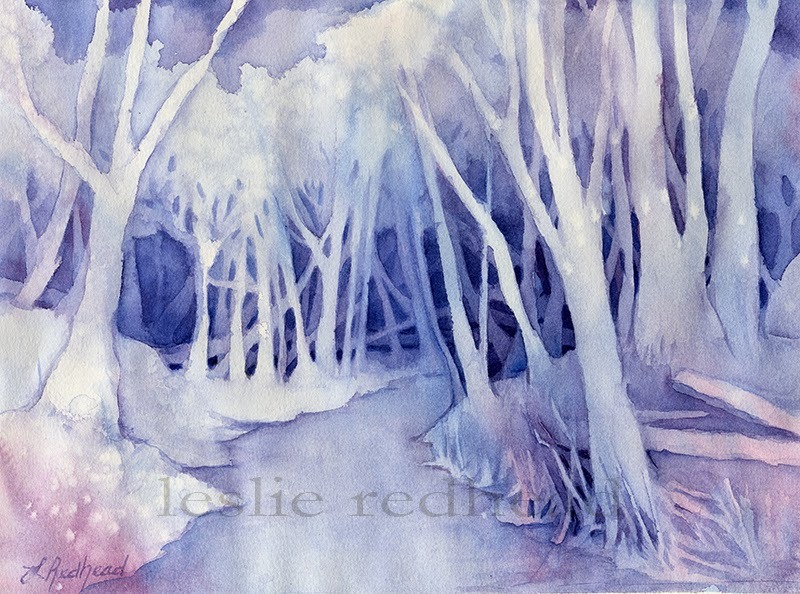 I absolutely love this medium but need a full day in the studio to paint with it. That is because I mix the paint from ground pigment and fresh eggs. The paint doesn't keep long but creates such magical colors as it dries. The buyer had seen this piece while it was being painted and fell in love with it then. She seemed to be excited by all the purples when she saw it completed. I have been playing around with more oils lately. So far I like to keep them small so I can complete them in just a couple of hours. Otherwise I get so busy that I forget to go back to them until all the paint has dried! Previously I have enjoyed glazing in oil and get impatient waiting for the paint to dry. 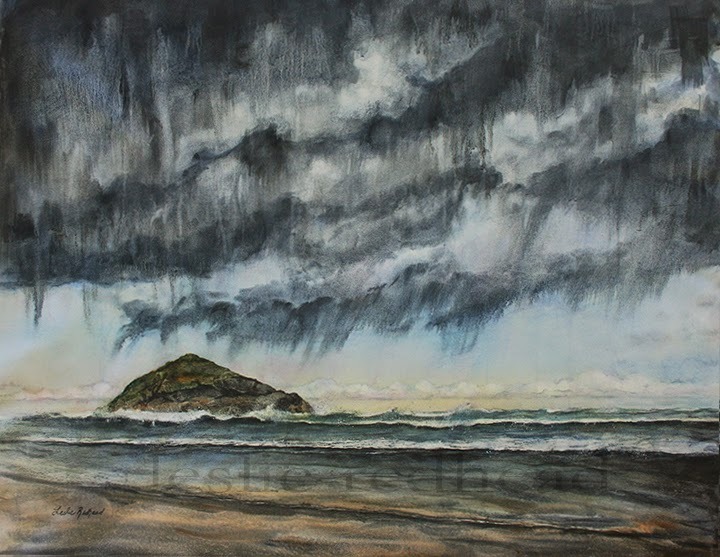 But I am now trying to work more wet in wet and love how the paint moves around. This is another scene from Mt. Washington on Vancouver Island. I've been doing a few winter landscapes in preparation for the holidays. I love blues and purple so any excuse to paint a whole painting with just those two colors is a great excuse in my book! Storm Chaser was so exciting to paint. I felt like I was chasing the storm, watching it gather and roll over me. It is of Incinerator Rock along Long Beach in Tofino, BC. I obviously love painting skies. 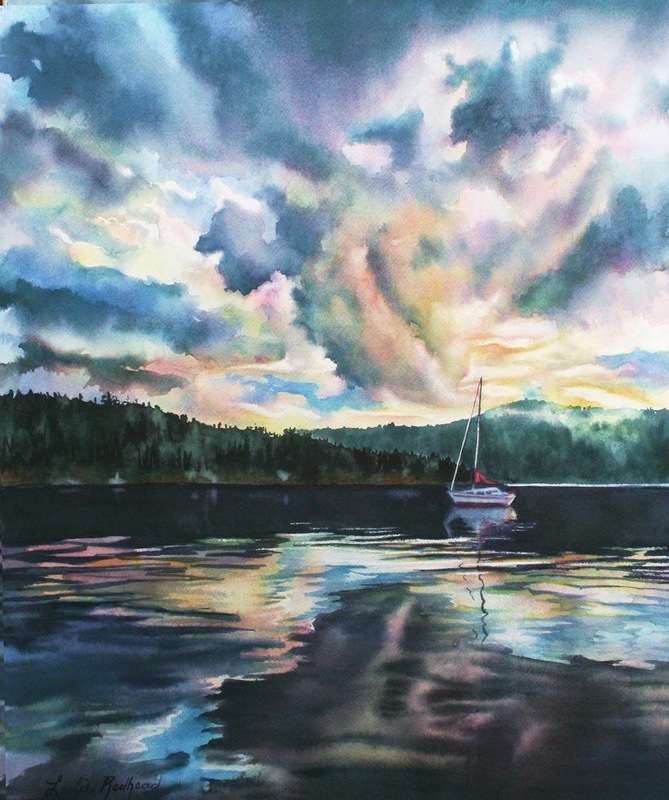 This one is of the sky over Brentwood Bay on Vancouver Island. 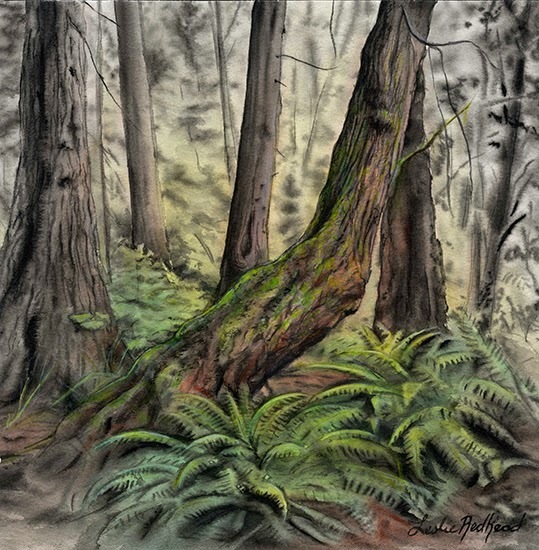 It is one that I painted over the summer and delivered to Madrona Gallery last month. I also delivered a couple of my other sky paintings. It was fun to see them all lined up ready to hang. This painting is yet another painting from my skies course. It is a simple sunset over water. The scene is looking west from Jericho Beach in Vancouver. As many of you know, I have been into the atmospheric lately, especially with the skies. And could I resist painting the Northern Lights? Absolutely not! 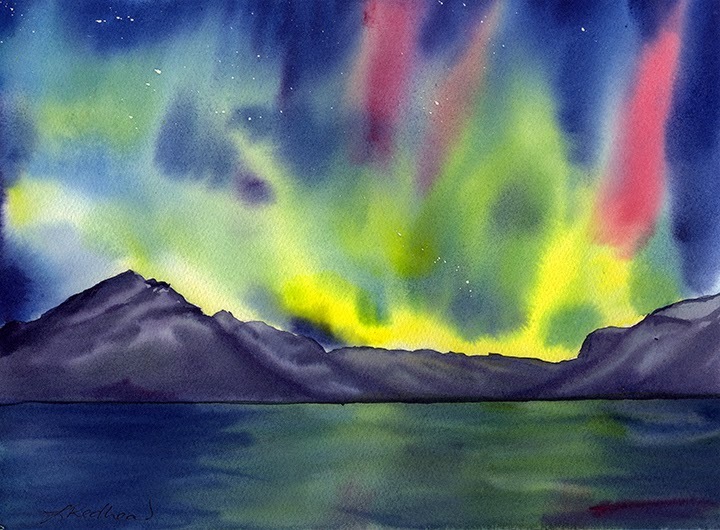 Watercolor seems the perfect medium to capture the Aurora Borealis. The paint moves similar to how I imagine the lights move and change. I haven't seen the real northern lights (only in photos and videos) but I hope that someday I can make it far enough north to do so. And I hope that it will be summer when I go. I have really been into skies lately. It is exciting to see the way clouds move and change. Golden Splendor was actually completed over the summer and I am now finally posting it. 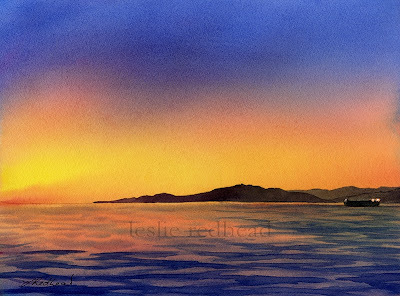 I really enjoyed painting the brillance of the setting sun on the water as it dipped behind the islands. 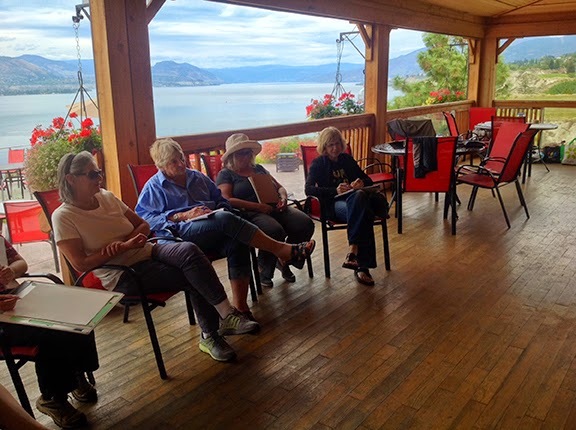 Last month was my annual Art in the Vineyard workshop in Naramata, BC. 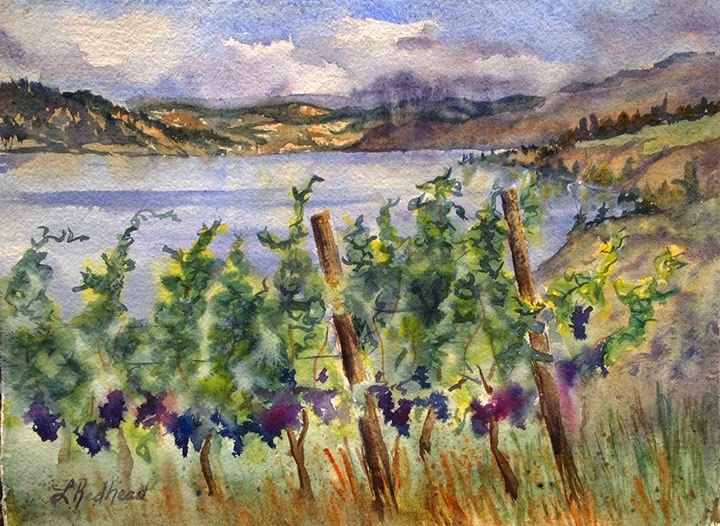 I taught with the talented watercolorist, Sam Boehner for four wonderful days of plein air painting among the vines, still life painting all things wine, and all while enjoying a fabulous culinary experience at every meal. 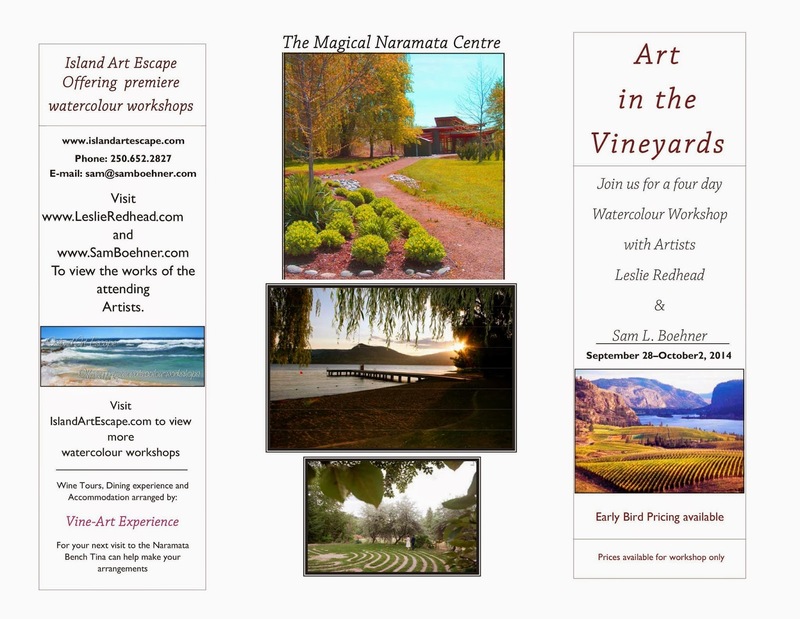 We had a great group of artists join us among the vines each day. The weather was mostly pleasant and the company was delightful. 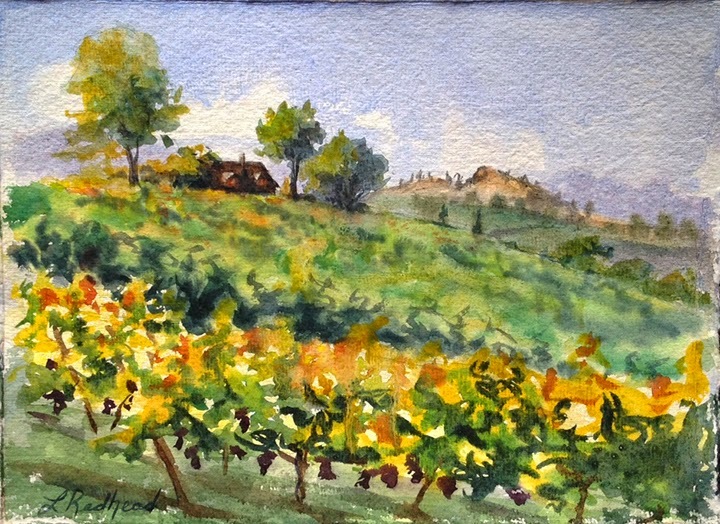 We had the opportunity to paint in 3 different vineyards over the 4 days. The first two were at Bench 1775 looking at the great view. 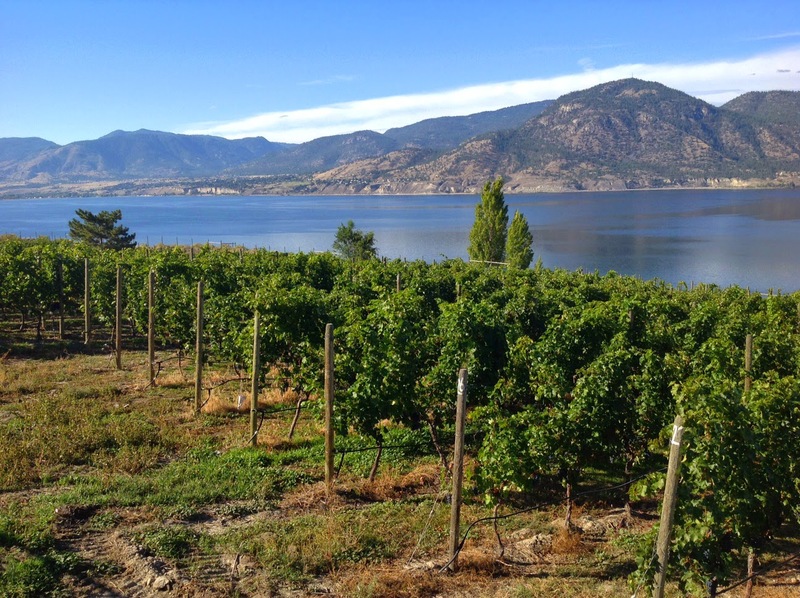 Then we spent a day at Hillside Winery among their beautiful gardens (and enjoying the best dessert ever!). 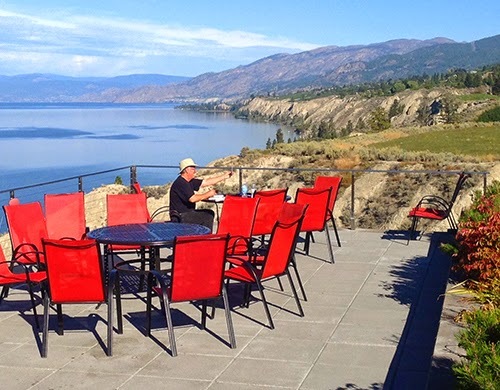 And finally we visited Serendipity Winery. 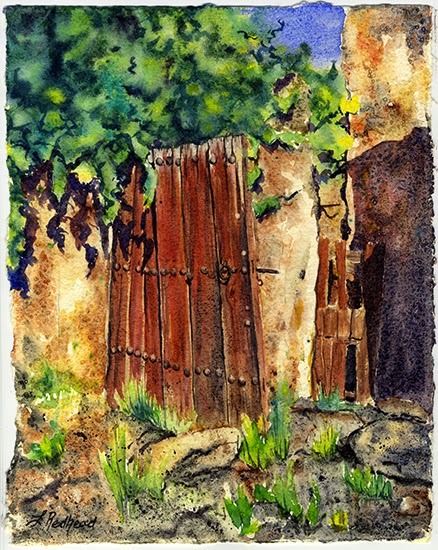 The view from Bench 1775 who is now carrying my paintings on their wall. Yay! As I have mentioned in a previous post, I was inspired to try oils while on my trip to Mt. Washington. 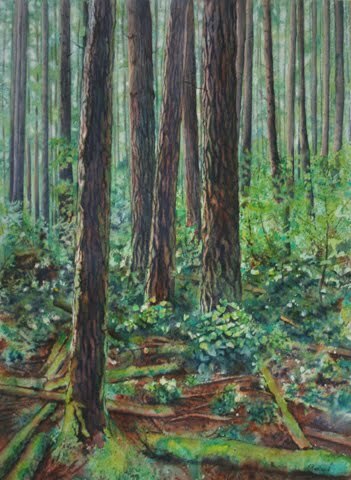 This past week I decided to paint a larger image of the area in oil. This is a view of the lake in Paradise Meadows. 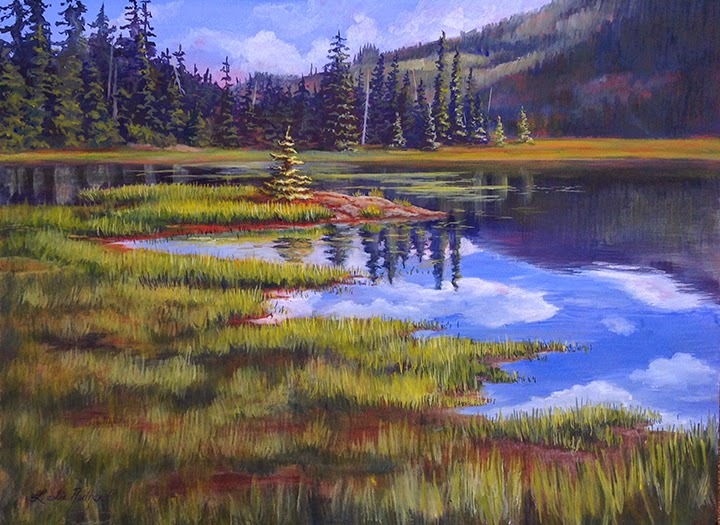 This piece will be on display November 7 at the Federation of Canadian Artists's Paint By Numbers Fundraiser. The Paint By Numbers event is an exciting evening of artists and patrons trying to grab the painting of their choice. Each patron has a number and is randomly called to choose a painting off the wall. It is slightly nerve-racking for the artist though. One hopes that their piece is not chosen last! A couple of weeks ago, I was invited by the very talented Nancy Goldman to be part of a Blog Hop. I was surprised to have received this invitation to be featured and to feature an artist whose work I greatly admire. 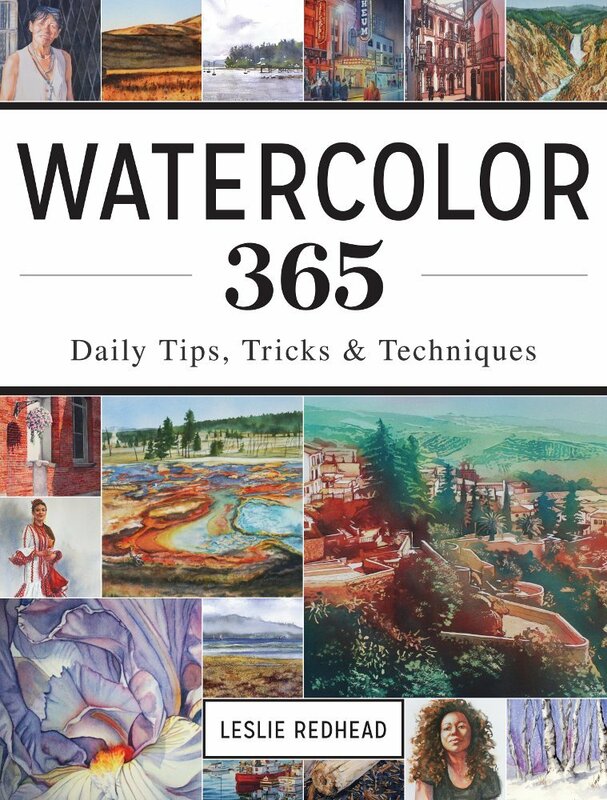 I have been following Nancy's blog for years and she seems to have mastered water and waves in all different mediums. 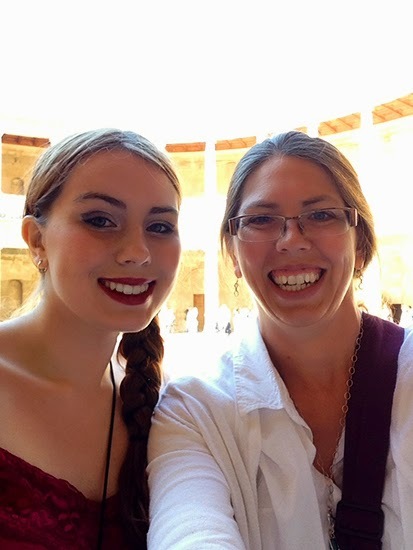 Last week, Nancy featured me on her blog. Today I will be featuring her along with answering some questions about myself, then I will feature a couple of other artists. 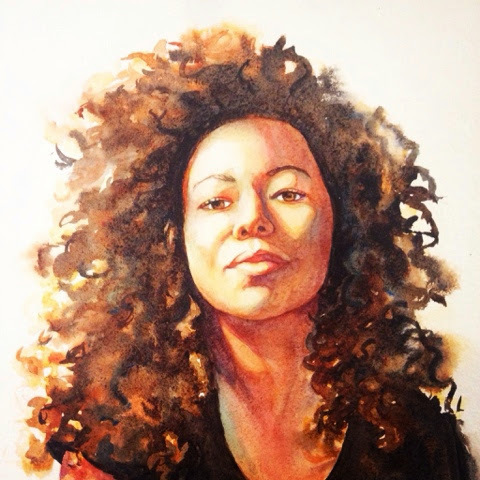 "I love to experiment with most mediums and styles of art. I get bored easily and can’t imagine painting in just one style or medium. 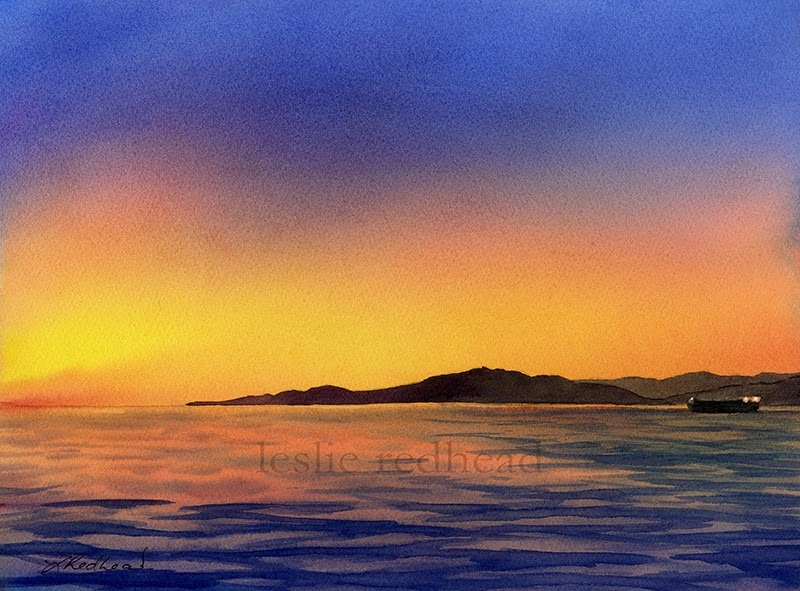 My favorite medium is watercolor and I enjoy glazing multiple layers of color to create the finished painting. 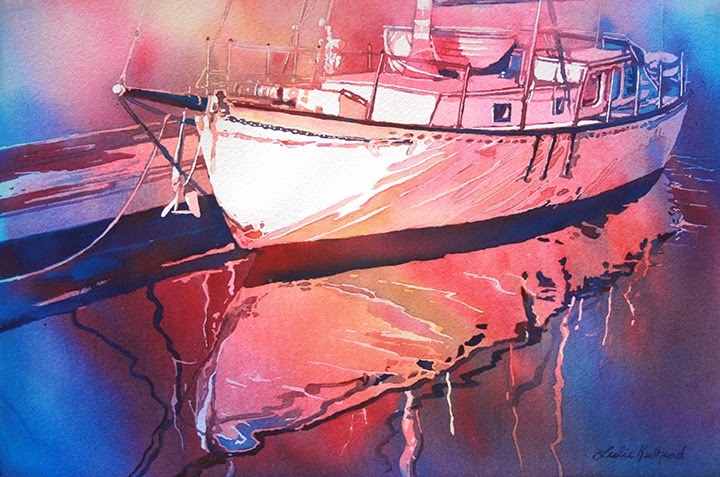 Watercolor paintings have a luminosity that can’t be achieved with any other medium. The transparency of the paints, along with the sedimentary qualities of some of the paint colors allow for a feeling of texture and light. 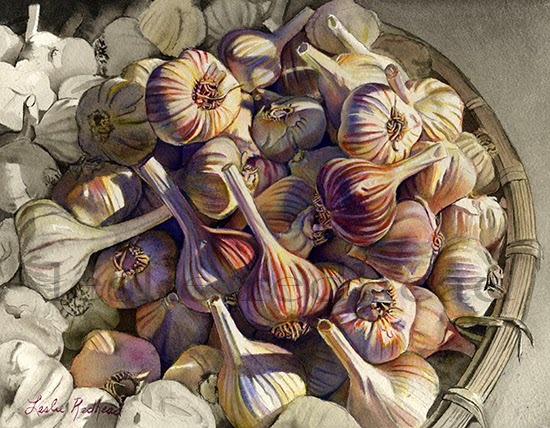 There are many techniques possible with watercolor, from loose and watery to tightly rendered paintings, which makes each new painting a wonderful adventure." I'm not sure that it is that different. I do like color and use it liberally. These colors are layered and stacked to create more depth. I also like detail, but not too much. My work is impressionistic with a touch of realism. 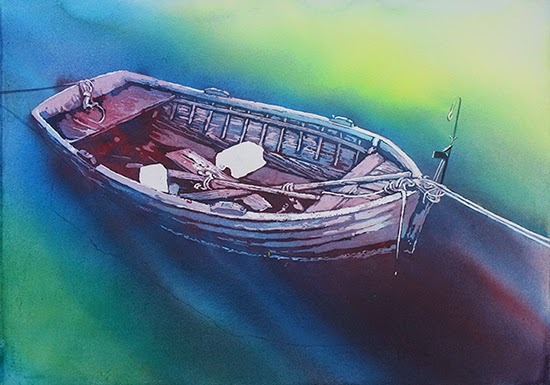 One comment I receive the most about the watercolors I do is that people can't believe it is watercolor and I am able to get such depth and richness with the paint. There are so many reasons why I create what I do. Some I recognize and I am sure there are others that I am not fully aware of. I do know that I create because I love. I love the people around me, the feel of the air, the way the light hits a subject, the interplay between light and dark, the movement of clouds, the wind, and patterns. I love color, a scene, a moment. I love the paint I am using, the feel of the brush, and I especially love when I can say all of what I am feeling without having to speak a word. I usually start with a photograph of a place or person that I have captured. Then I take that photograph into Photoshop and play with sizing and cropping, as well as adjust lighting and color. Photoshop becomes my sketchbook. Then I print it out, draw it out, and paint. Sometimes if I am having a hard time deciding between which photograph to work from, I will print out the images and put them in my studio. Then over the next few days, one of them will "speak" more to me than the other. That's when I know which painting needs to be done first. Now I will feature other really awesome artists. 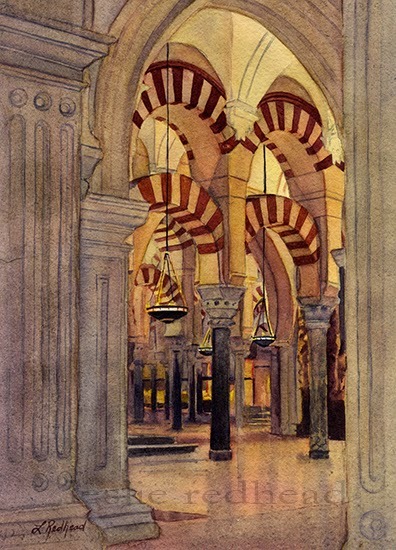 Kathryn is a watercolorist that I started following several years ago. At the time I started following her blog, I didn't quite realize that she lived so close to Vancouver until I moved to Vancouver. Then one day Kathryn emailed me and mentioned getting together for a chat. We were instant friends. 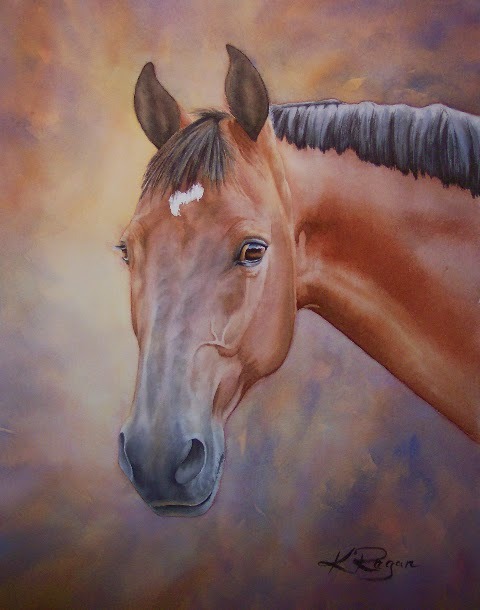 Kathryn's love of animals is evident in her paintings. 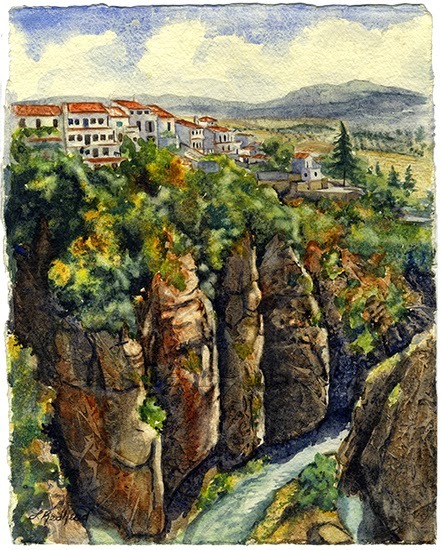 Kathryn is an active member of the Federation of Canadian Artists, and recently won second place in the “Works on Paper” show. 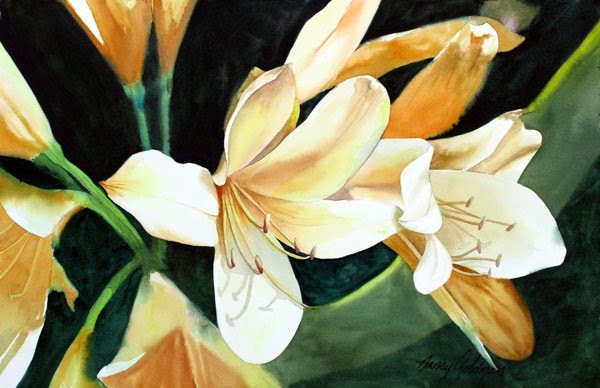 Her work can be seen on her blog site, Studio at the Farm, and at Ballantyne Gallery.Kathryn is passionate about LIFE. As an artist, she brings ardor and technical proficiency to her creations, fashioning works that are realistic, vital and warm. Angela is another Canadian artist from BC. 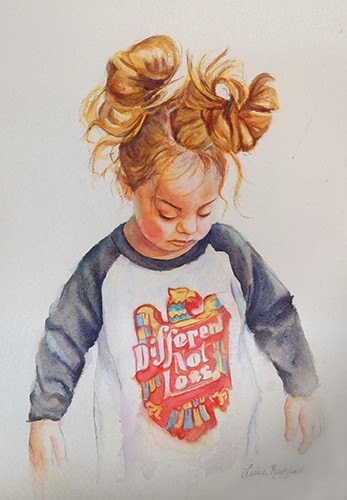 She is a mother, artist, educator, and devout Christian. All of which I relate to very well. "There is something about beauty that demands a response. Hands clenched on the steering wheel, feverishly memorizing tone, texture; vivid hues of sun-streaked sky, grain splashed with cobalt shadow. 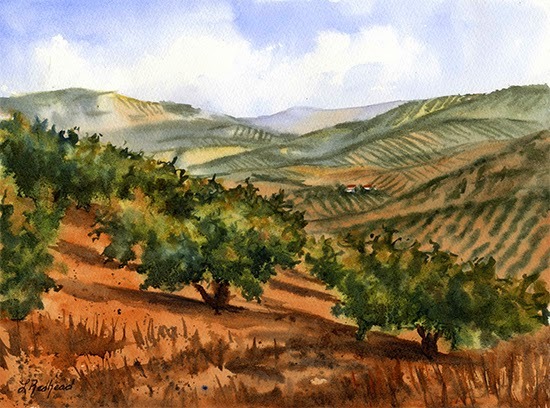 From panorama to palette to paper, watercolour my voice, a transparent, fluid means of savouring the glory inherent in the spaces I occupy.A self-taught watercolour painter, over the last twenty years my art career has been rich and varied. In addition to painting and teaching watercolour in my studio and online, I’ve worked as a graphic artist, web site designer and freelance writer; served on the board of a local art society; shown my art in solo and group shows; taught art classes to children and adults; been featured in magazines, newspapers and web sites; and even been featured as a watercolour expert for a local television station. The world is full of exciting opportunities and new people to meet, learn from and enjoy, and I love to be a part of it all. 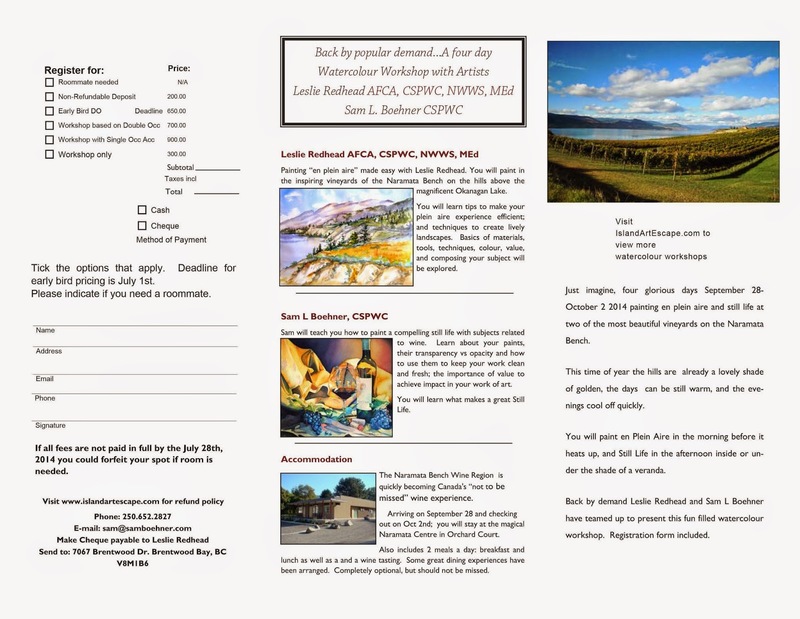 I'm a member of the Federation of Canadian Artists (Peace River Chapter), the Peace Watercolour Society and the South Peace Art Society. 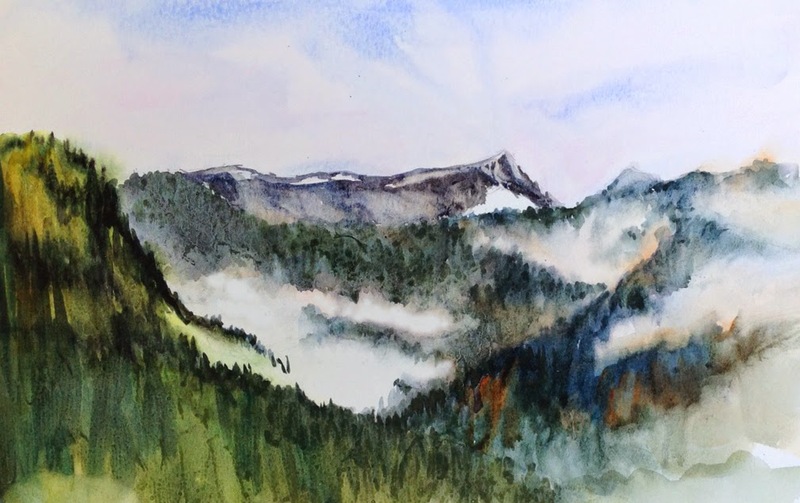 In addition to painting, I teach paper crafting, homeschool my three children, support my husband in his business and love living on an acreage in northeastern British Columbia. It takes creativity to live a full and interesting life, and I love creating art every day!" Thank you to all of these amazing artists for letting me feature them. I hope all of you enjoy reading about them and being inspired by their talent. 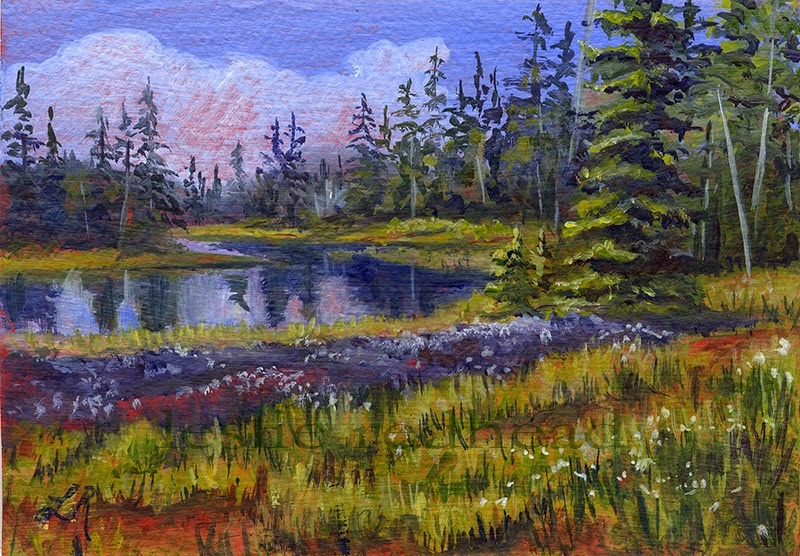 Last weekend I had a wonderful adventure plein air painting at Mt. Washington on Vancouver Island. This adventure was planned by fellow artist and friend Perrin Sparks. 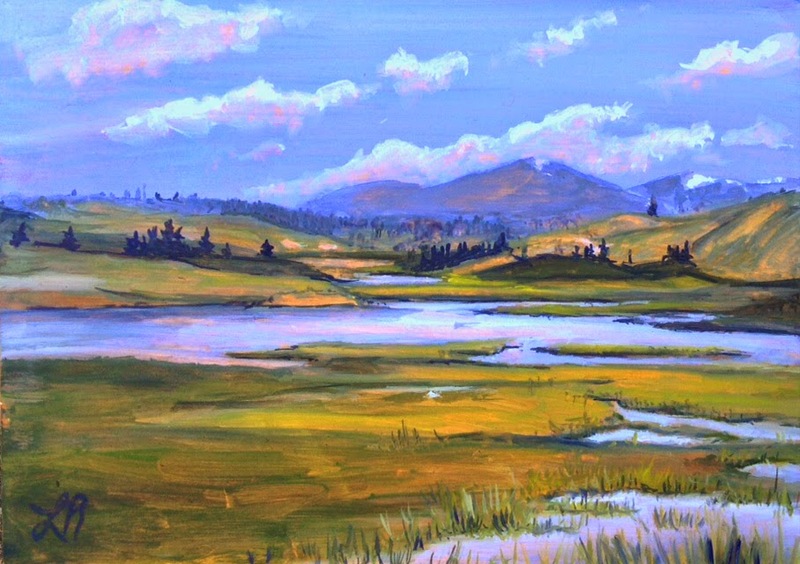 Perrin invited several artists to join her for a weekend of painting, painting and more painting. I was also joined by artists and friends Sam Boehner, Marney-Rose Edge, and Audrey Bakewell. The weather was at times rainy and cold. 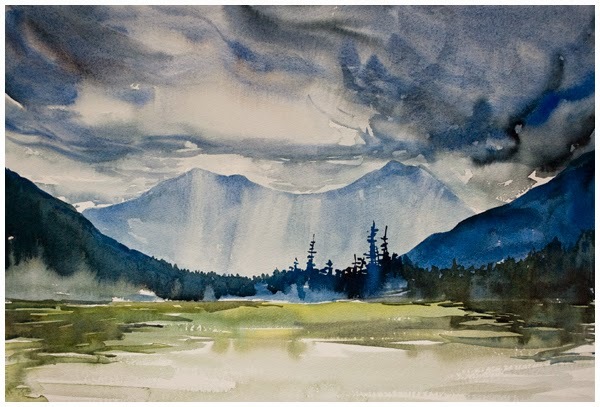 This made for some dramatic skies as the clouds swirled over the mountaintops and fun moments as we had to quickly abandon our plein air masterpieces when the skies did open up. Because of this, I started many, but finished few. I was smart enough to take photos so I can later complete the scenes in the studio. Although I took my watercolors, Perrin and a few others inspired me to dip my brush back into my oil paints. 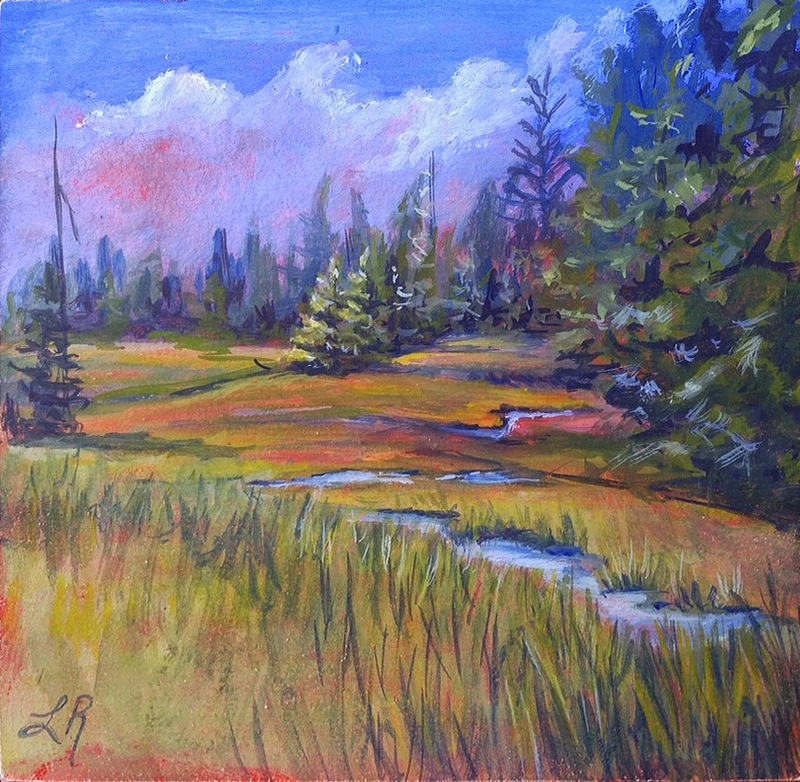 When I returned home, I did just this and have completed a couple of small oils since (including the Paradise Meadows study). As many of you are aware, I had an exhibition of my work this past Sunday. It felt great to be back! I use to have studio tours twice every year when I lived in Victoria. Since moving to Vancouver 3 1/2 years ago and working on my degree, I haven't had an opportunity to show my work all in one place. A kind friend offered her home for me to hang my paintings and let our friends peruse through my private collection. 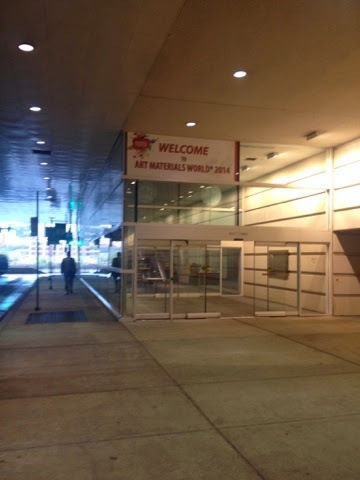 I met many new people and art lovers and felt like the day was a huge success. Thank you to all those that were able to make it and for your continued support. That's me standing with several paintings and showing my video about my painting process. 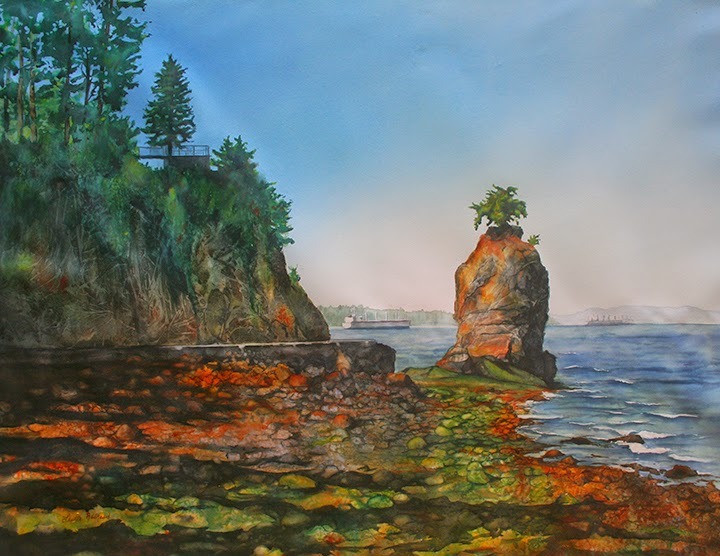 This coming Sunday, August 17, I will be having a private exhibition and sale of my work at the home of one of my patrons in White Rock, BC. I am excited for this event because it is my first solo show in nearly 4 years. Since my focus has been on completing my Masters degree, I haven't had a chance to show work from my own private collection until now. Several new and not previously seen pieces will be at the show and available for purchase. If you are interested in attending the event and would like an invitation, please email me at leslieredheadart@gmail.com. I will be happy to send one along. I know I said in the past that I really don't like the look of acrylic. I felt like it was too plastic and didn't have the same movement and glow of watercolor. 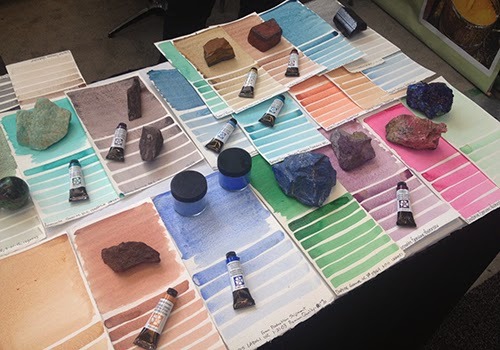 But that was before the acrylic paint making pros decided to try to make acrylic more like watercolor. So a few weeks ago, I decided to give some acrylic paints a try. Genesis is my first painting done with these newfangled acrylics. The acrylics I used are from Chroma Paints and are of the Atelier Free Flow Line. 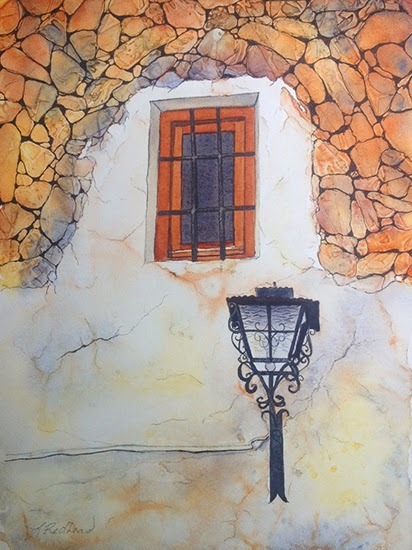 I was amazed at how the paint did flow similar to watercolor when doing wet-in-wet. The paint even stayed wet in my palette for a very long time. The colors have a nice vibrancy to them and layer well. 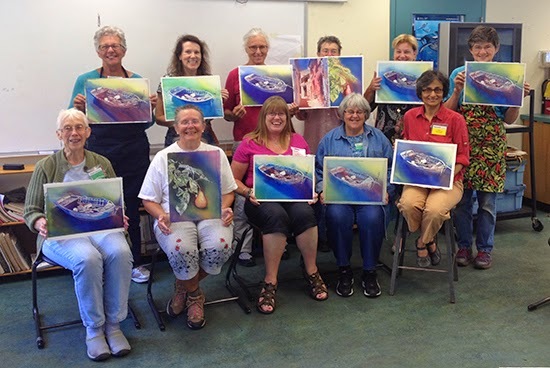 Overall, I enjoyed painting with them and have ideas to use them even more. 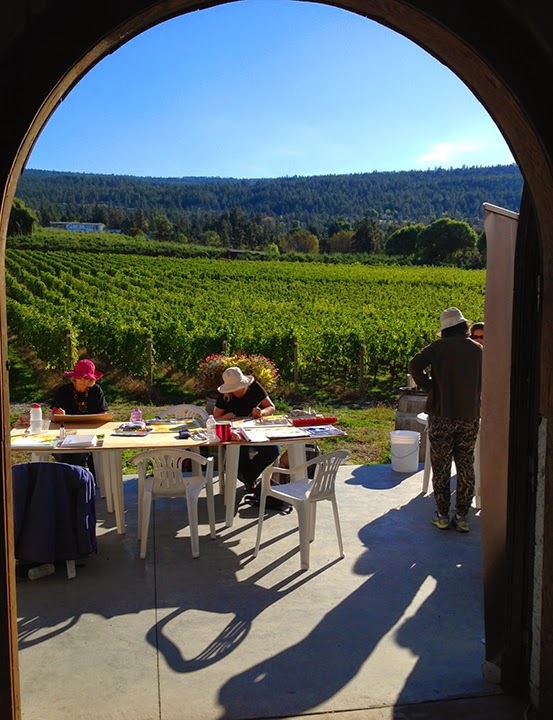 Last weekend I taught a pouring workshop at the Metchosin International Summer School for the Arts at Pearson College in Metchosin, BC. Pearson College is a world college and is one of the most beautiful campuses I have seen. It is located on the southwestern tip of Vancouver Island with lush rainforest type foliage and gorgeous turquoise water. 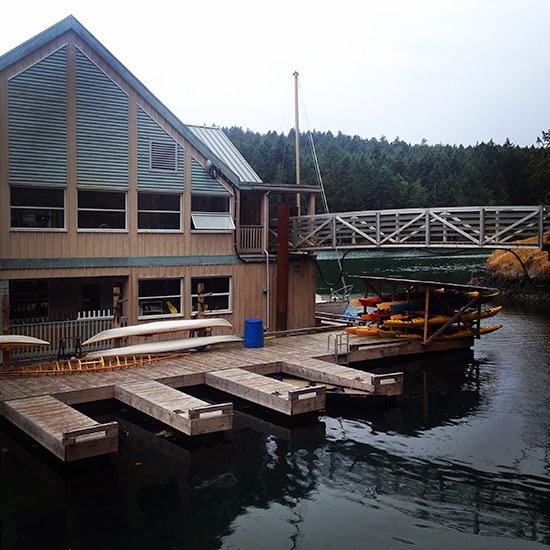 My studio for the weekend was in the boathouse, which was appropriate since we painted boats. I kept pinching myself while I was there, thinking, "Wow! this is my classroom! I love my job!" I had a wonderful group of 12 people, mostly from the area. Almost all of them did the boat along with me and they did a fabulous job! I hope that they are able to apply what they learned in the workshop to their own home studio practice. 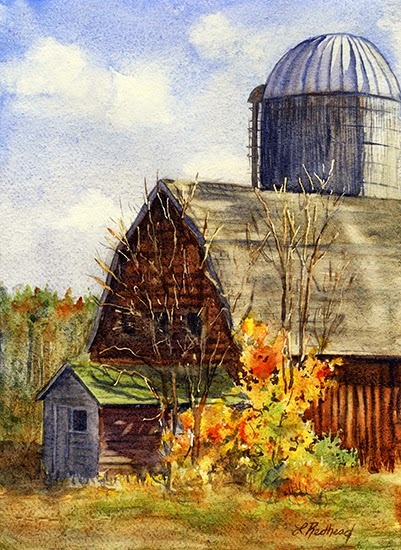 As many of you know, I have been into painting barns lately. This one is from Londonderry, New Hampshire. 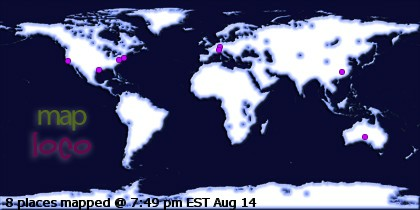 We lived in New Hampshire and Massachusetts for several years before moving to Canada. I left many wonderful friends behind. 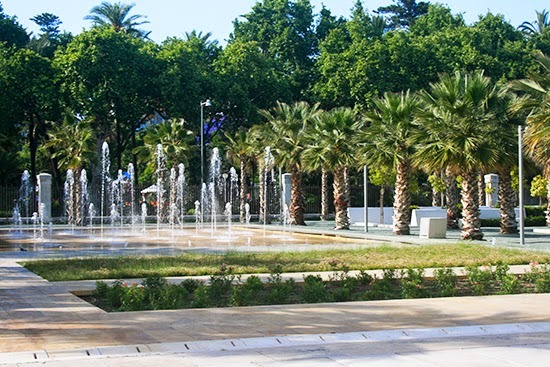 I miss the beauty of the place as well as the people. I think of it often and sometimes wonder what things would be like if we had not moved. Perhaps more barn paintings like this one. 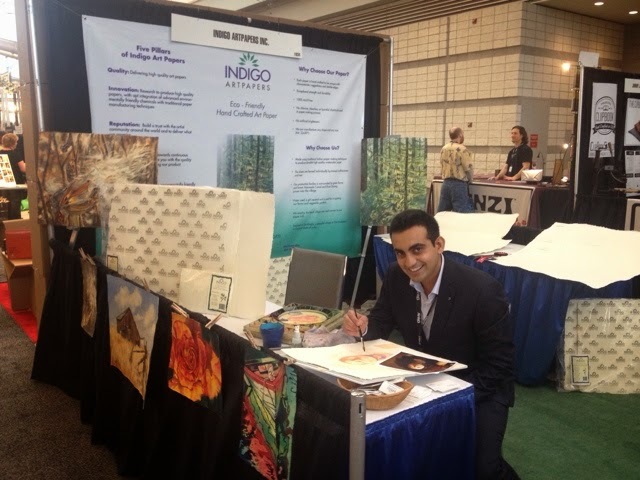 I'm in Pittsburgh and just finished my first day of demonstrating for Indigo Art Papers. 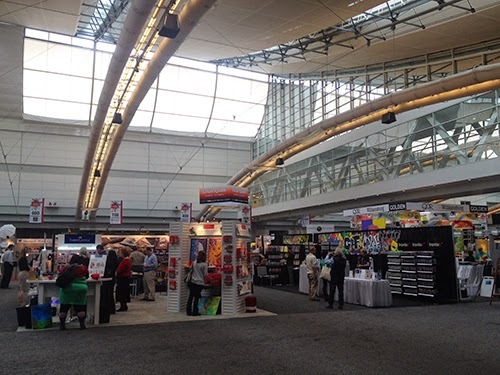 It is all so very exciting to see the products, the artists, and the buyers. Here is our both. The owner, Sundeep, is pretending to paint. Ha! See the banner? I did that. I'm not a graphic designer but tried to pull something together for the show. My paintings are also in the front. I really have met some fabulous people and of course gushed over the Daniel Smith booth. The had their line of primatek colours displayed with all those gorgeous rocks. ( yes, I love rocks! They make pigment :) from which I can paint) I forgot my camera when I visited them so I'll try to remember tomorrow. Then I met another really cool artist. 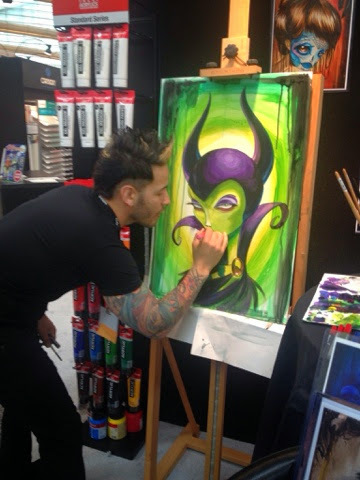 He was creating this amazing painting of my favorite villain, Milificant from Sleeping Beauty. His name is Christian Masot. And here is what I demonstrated today. I really felt like I was going to be this little fish swimming with the big ones but once I got going, I felt good. It all just came to me and I'm happy with what I completed.